Though it's rarely a breeze, attic conversion holds tremendous appeal for homeowners seeking more living space under their own roofs. Want more livable space in your home? Don’t want to spend a king’s ransom? 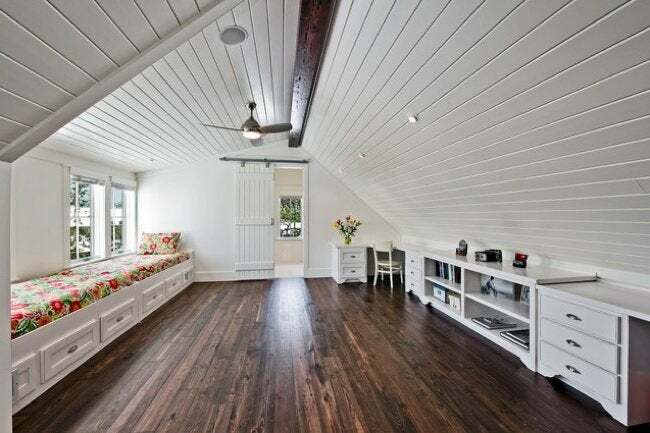 Attic conversion has fit the bill for countless homeowners over the years. Unlike many basements, attics are dry, and being free of major appliances (e.g., the furnace), they are also quiet. You can devote the finished space to any number of purposes: Attics are suitable as home offices, TV rooms, art studios and even bedrooms—the list of possible uses goes on at length. Before starting on an attic conversion project, you’ll need to negotiate a gauntlet of building codes. Of course, these vary from one municipality to the next, but most codes correspond to one or another edition of the International Residential Code for One- and Two-Story Dwellings (IRC). To view the latest IRC codes (as well as previous editions), go here. If you’re confused about which edition bears relevance to your individual home, ask an official in the building department of your city, town, village or hamlet. Is Your Attic a Candidate? Area. 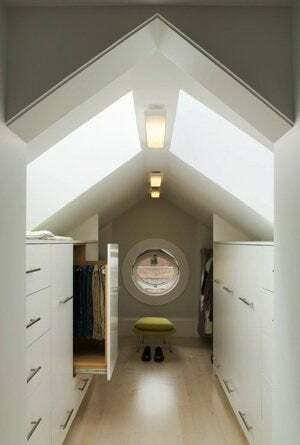 Habitable attic space must satisfy the same requirements that govern rooms in the rest of the house. To pass code, there must be at least 70 square feet where the ceiling height is 5 feet or higher. Windows and Openable Area. Minimum glazed area is required to equal or exceed 8% of the usable floor area. So let’s say your attic has 200 square feet over which the ceiling is at least 5 feet high. Your window area must be at least 8% of 200 square feet (16 square feet). Meanwhile, the 4% openable area requirement means you need 8 square feet (4% of 200, that is) providing access to the outside. Ceiling Height. At least 50% of the usable area (calculated above) must have ceilings of at least 7 feet. In other words, if your attic has 200 square feet over which the ceiling is at least 5 feet high, then for a minimum of 100 square feet (50% of 200, that is), the ceiling height needs to be at least 7 feet. Some homeowners satisfy this code by installing a dormer. In effect, a dormer raises the height of a ceiling that you otherwise wouldn’t be able to walk beneath. Doghouse-style dormers admit natural light and promote ventilation, while shed dormers maximize usable attic space. Consult an architect in either case; few “improvements” compromise the look of a house like an ill-conceived dormer does. Heating. Code requires the heating system in your home to be capable of maintaining a steady attic temperature of at least 68 degrees Fahrenheit (assuming the annual low temperature outdoors). Homeowners usually find no cause to extend their heating systems, since hot air rises through open stairwells and attic insulation does an effective job of keeping in that heated air. Support Capability. For a habitable attic served by fixed stairs, code requires a load capacity of 30 pounds per square foot. You can use an online calculator to aid in your assessment of the floor’s strength, but in order to use a tool like this, you must know a host of details about the framing of your house—the width and depth of joists, their span, the amount of spacing between them, and what species of lumber they are. Ultimately, the building department official in your municipality is the one to decide such things as whether your floor is strong enough. Observing all codes is a contractor’s responsibility, but if you plan on handling your own attic conversion, be prepared to acquaint yourself with every pertinent specification. In the course of a conversion project, the codes surrounding attic access can often be challenging, since most attics were designed, not to be lived in, but rather for storage, utilities (e.g., air handlers), or both. If you currently reach the attic by means of a hatchway or pull-down stairs, then you will need to carve out space for a length of permanent stairs—several square feet in the attic and on the next level down. Code stipulates that stairways must be 36 inches wide (or wider), with treads that are 9.5 inches deep (or deeper). The maximum rise from one tread to the next is 7-3/4 inches, and head clearance has to meet or exceed 80 inches. Winding stairs are generally permissible, though some restrictions apply. 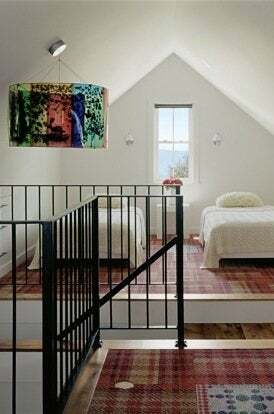 Existing attic stairs rarely conform to today’s code. Before moving forward, it’s best to discuss the matter with a local building department official. Exceptions are sometimes granted when upgrades are not feasible. For a complete picture, visit the Stairway Manufacturers’ Association. Note that, in addition to access by stairs, a habitable attic needs at least one operable emergency escape-and-rescue opening. Codes regulate this opening’s minimum dimensions and proper placement. My preference is to push the knee walls close to the eaves, creating as much floor space as possible. Low cabinets and bookcases fit snugly in the space under slanted ceilings. In a lot of attic spaces, ceilings are what you see, more or less, so I think it’s worth splurging on them; consider wood boards. When it comes to flooring, wall-to-wall carpeting over a plywood subfloor is one popular option. A much less costly approach is to paint the plywood and add a few area rugs. In the end, finishing your attic conversion is largely a matter of personal taste. There are no codes governing your choice of paint color, thankfully!